Evelyn, whose earliest memory was of seeing a zeppelin during the First World War, had led a full life, the pace of which slackened little until very recently. At the age of 50 she had taken up teaching – something she continued until she was 81. The Hyde Park Fun run was completed by her at the age of 69 and for her 90th birthday Evelyn went to watch the snooker championship at the Crucible in Sheffield. Evelyn was still driving confidently at the age of 94, a veteran of more than one driving expedition to the family’s favourite haunt of Italy. Evelyn never lived or worked in Saltaire, but her name is closely associated with it because of a book – “The Great Paternalist”, written by her historian husband, the late Jack Reynolds. The book is without doubt the finest book on Sir Titus Salt written in the 20th century. While Jack, a lecturer at Bradford University, was the professional historian, the production of the book came to involve his whole family. Evelyn collated the necessary census returns, and typed and retyped the book so many times that she knew it by heart (this before the availability of word processors and PCs). Jack & Evelyn’s three daughters Janet, Jennifer and Catherine searched out urgently needed information in support of their father’s researches. 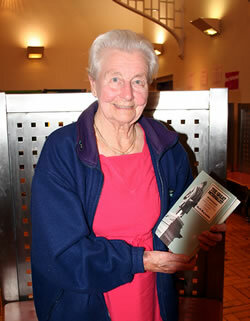 Evelyn came to the inaugural meeting of Saltaire History Club in 2006 – to the delight of everyone who met her there - and she was clearly pleased to see that Jack’s reputation in the telling of Saltaire’s history was secure and recognised. Our thoughts at this sad time are with Janet, Jennifer and Catherine and Evelyn’s wider family. The funeral service and cremation were held at Nab Wood Crematorium, on Friday, June 12, at 1.20p.m. Donations in memory of Evelyn may be given to Age Concern, or through the funeral directors, A. Hey & Son Ltd, tel 01274 571021.